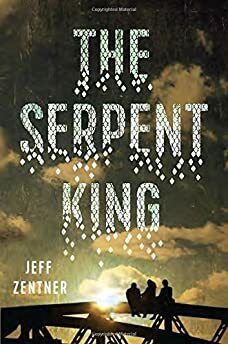 Largehearted Boy: Book Notes - Jeff Zentner "The Serpent King"
Book Notes - Jeff Zentner "The Serpent King"
Jeff Zentner's The Serpent King is one of the year's finest YA novels, an impressive debut. "Characters, incidents, dialogue, the poverty of the rural South, enduring friendship, a desperate clinging to strange faiths, fear of the unknown, and an awareness of the courage it takes to survive, let alone thrive, are among this fine novel's strengths. Zentner writes with understanding and grace—a new voice to savor." This song plays a small but crucial role in the book. It's Lydia’s favorite song and therefore becomes one of Dill's favorite songs. It shows that Lydia is not one to just listen to whatever's on the radio. Also, through it we see how Dill has to figure out how to turn the names of normal bands into Christian bands on the spot when his mom asks. This song isn't specifically mentioned in the book, but New Order is, and I imagine Dill citing this song as an example that New Order is actually a Christian band. This is a gorgeous song about inner turmoil and demons. Sharon Van Etten spent some of her formative musical years in Murfreesboro, Tennessee, a city that figures into The Serpent King. Her songwriting is similar to how I imagine Dill's would sound. There's more than one pivotal scene in the book in which the characters are looking up at the night sky and reflecting on life and their place in the world. Chvrches is the kind of band Lydia would love--they're dark, intelligent, soulful, and romantic and their lead singer is exactly the kind of woman Lydia would have a crush on. And thus Dill would love them too. Ditto everything I said about Chvrches above, plus this song speaks of breaking free from places, one of the biggest themes in The Serpent King. This is one of the most hauntingly beautiful songs ever written about small town life. This song pulls my heart out. I tried to write The Serpent King so it read the way this song sounds. "I was born in an abundance of inherited sadness." Damn. That line. This song sounds to me like finally coming to terms with faith--triumphant and soaring. Listen to this song as you read the last page of the book. The character Travis is fairly indifferent to music for the most part. He likes his buddy Dill's songs, and that’s about it. But this song describes him perfectly. No matter what forces are arrayed against him, he follows his own arrow where it leads. This song makes me think of identity and the myths we built around and about ourselves. Identity is hugely important in The Serpent King. This song sounds to me like summer. Plus Lorde really reminds me of Lydia. In fact, a fictionalized version of Lorde ended up in the book. This song is like “Jacksonville Skyline” in that it reminds me of small towns. It has a poetry to it that reminds me of Dill's worldview. This song sounds to me like how Dill feels about Lydia. This song reminds me of what I think Dill’s songwriting would sound like. And it's a song about wayward fathers, something Dill knows something about. This song sounds to me like surviving personal demons. Imagine this song playing as Dill leaves the prison after visiting his father for the last time. She wasn’t one of the models for Dill since she came up after I’d written the book, but she certainly resembles him. She's 19 and goes to MTSU. I hope The Serpent King reads like how this song sounds. Plus this is a Nashville band. Sorry, but I had to. This song is how Dill feels about Lydia.